Bathroom accessibility and bathroom safety can be a challenge for individuals struggling with bath safety issues, or with mobility challenges. Often there are many solutions available to meet the needs for bathroom safety and handicap bathroom accessibility. BILD offers the unique expertise of interior design, occupational and physical therapists, our owner who is a nationally recognized educator of accessible home adaptations. There are numerous options available to help meet your needs for bathroom safety and independence, and part of our mission is to provide and educate you on the various options that are available. What is best for you may depend on your goals, your function, and your future needs, and we consider all of these on an individualized basis when we look at your bathroom accessibility needs. Our design staff specializes in creating beautiful spaces that maintain the aesthetic integrity of your home as a beautiful place. We can work within your budget, and provide options that help to create a space that is comfortable and beautiful to live in. With our background as occupational and physical therapists, we understand functional needs for safety an independence in the bathroom. We will go beyond simple ADA bathroom accessibility, to actually individualize bathroom design and layout for your individualized goals and needs. 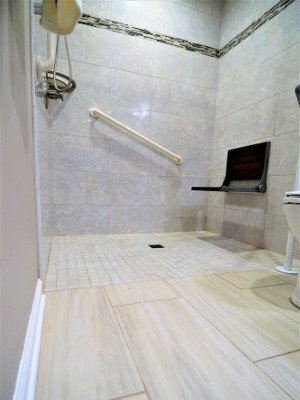 We can start with a phone call to discuss the options and solutions for bathroom accessibility. BILD can provide an individualized design and plan if you are looking to design a beautiful accessible bathroom remodel, modify your existing bathroom with modification solutions, or provide other bathroom accessibility solutions to fit your needs. We have many grab bars, displays and bathroom accessibility solutions at our Milwaukee Accessibility Showroom, or we can come to your home and take a look at accessibility needs for your home. Having the regions most highly trained accessibility specialists who are physical and occupational therapists ensures that you will find the best solutions to fit your needs. Our experienced tradesmen and designers help you to maintain a beautiful bathroom as well. We provide options to help you to achieve safety and independence while using only the highest quality products. Grab Bars help prevent falls in the bathroom, the highest risk area of the home. They can be placed anywhere and serve multiple functions. Popular brands feature vinyl coated surfaces that are warm to the touch, in addition to stainless steel bars that double as bathroom fixtures. Barrier-free entries create easy walk-in or roll-in access. Tile or fiberglass surrounds can be chosen depending on needs. Different options to contain water include sloped flooring, linear drain systems, weighted shower curtains or flexible, rubber water barriers. Tub Cut Outs are an inexpensive option to make the existing tub accessible. This may be performed with any material: fiberglass, steel or cast iron. A removable door is added to keep water in. A walk in tub is designed for scooting transfers or use of floor transfer lifts. Unlike a standard bathtub, a walk in tub has an integrated seat, doorway entrance and hydrotherapy options like air-jets and whirlpools, in addition to heated seats for comfort. The purpose of a shower/bath transfer system is to provide access without remodeling. Customizable with straps and lateral supports, they can have optional tilt or recline features. The track system passes over the tub barrier, and the chair can be wheeled over to the toilet where there’s an integrated commode opening. A commode pan insert is also available. Battery-operated bathtub lifts mechanically lower the user into the tub and lift them up to sitting. Lifts come with varied heights and weight capacities and are water-safe.